Everything you need to know to get the Nemesis Exotic Marksman Rifle in The Division 2. 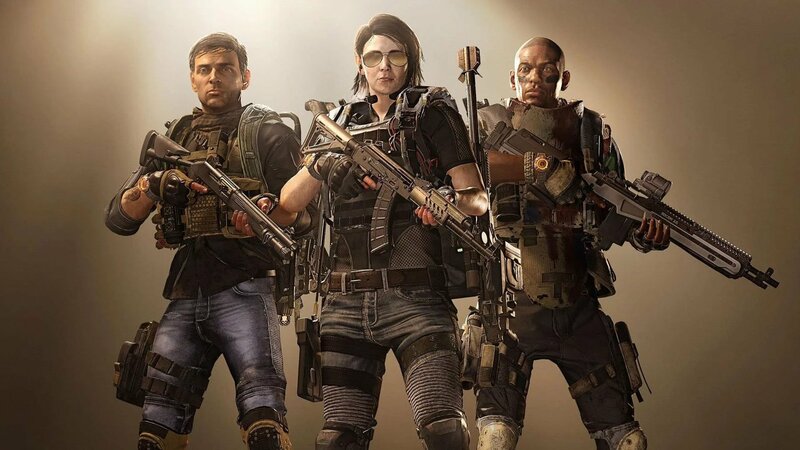 The Nemesis Exotic Marksman Rifle is just one of several exotic weapons that players can unlock and add to their arsenal in The Division 2. But, if you want to get your hands on this weapon, then you’re going to find yourself with quite a bit of work to do. We’ll go over everything you need to know in the guide below, so let’s dive right in. Unlike the Merciless Exotic Rifle or the Chatterbox Exotic SMG, the Nemesis Exotic Marksman Rifle is going to be a bit more difficult to acquire. Like the Chatterbox, players will need to gather several parts and craft the Nemesis themselves. However, you won’t even be able to start acquiring these pieces until after you hit World Tier 5. For more info on how to increase your World Tier, be sure to refer to our handy guide on the matter. When you do reach World Tier 5, you’ll need to play through the Invaded Missions and then unlock the Tidal Basin Stronghold. This means you’re going to spend a good bit of time fighting the Black Tusk forces, so make sure you’re ready for a fight. After unlocking Tidal Basin for the first time, player through it and advance all the way to World Tier 5. This is where the fun really begins. You won't be able to complete Tidal Basin until you reach World Tier 4 and meet the other requirements. By advancing to World Tier 5, you’ll unlock the final step of the endgame content in The Division 2. At this point, the Invaded Missions and Invaded Strongholds will begin circulating each week, giving you ways to replay the story mission and earn new loot for your trouble. This circulation plays a key part in the advanced of your quest to get the Nemesis Exotic Marksman Rifle. First, you’re going to need to head over to Tidal Basin and replay it. At this point you’ll be able to choose the difficulty you want to play on, allowing you to proceed at your own pace. What you want to do this time around is play through the stronghold mission until you come to the area where Manny tells you to patch ISAC into a laptop. When you first reach this section, head upstairs in the nearby buildings and search for a Black Tusk Keycard. Once you have the keycard, continue fighting through the mission until you reach the hovercraft cargo bay area. Move through the area until you reach the back of the bay. When you’re instructed to turn right, head to the left inside and make your way to the locked door ahead. Interact with it to use the Black Tusk Keycard to gain access to a room with a weapon crate. Inside the crate you’ll find the Drestia SR-1, a High-End Marksman Rifle. You will need to complete the Capitol Building Stronghold for a chance to kill "Prime" and score The Scourge, one of the main pieces needed to craft the Nemesis. While you might be inclined to keep this weapon, in order to start the quest for the Nemesis Exotic Marksman Rifle, you’re going to need to deconstruct the Destria SR-1. Doing so will reward you with an Exotic Component called Marksman Rifle: Scope – The Tally. Looking at the description of this item you’ll see that it has three names inscribed on it: Shorty, Kultz, and Prime. To obtain the next three pieces of the Nemesis, you’re going to need to replay the three Invaded Stronghold missions. The names inscribed on The Tally scope are the names of three Black Tusk bosses. You’ll find Prime at the end of the Capitol Building Stronghold and killing him will drop the Marksman Rifle: Barrel – The Scourge. The next part, the Marksman Rifle: Stock – The Bridle can be obtained by killing Klutz in the District Union Arena Stronghold. Finally, you can obtain the final part, the Marksman Rifle: Bolt by killing Shorty, the named boss at the end of the Roosevelt Island Stronghold. The big caveat here, though, is that you’re not going to be able to complete all three of these parts at the same time. 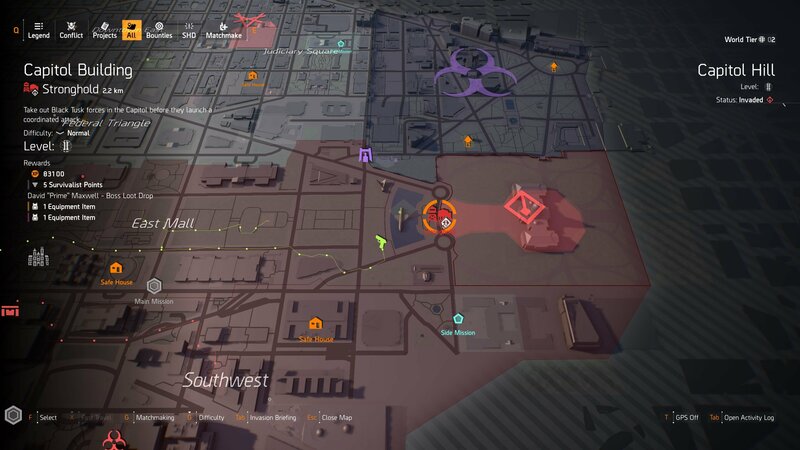 This is because of the weekly rotation system that Ubisoft has set up for The Division 2’s endgame. Once you reach World Tier 5, the Invaded Missions and Invaded Strongholds will change out each week, giving access to different variations so players continue to see different content each week. Because of this, you’re going to need to wait for each stronghold to become available to play again on Invaded. While this guide isn’t complete just yet as we’re waiting on all the final details to be found so that we can complete the Nemesis Exotic Marksman Rifle, we’ll be sure to keep an eye on things and update it with any new information that becomes available. 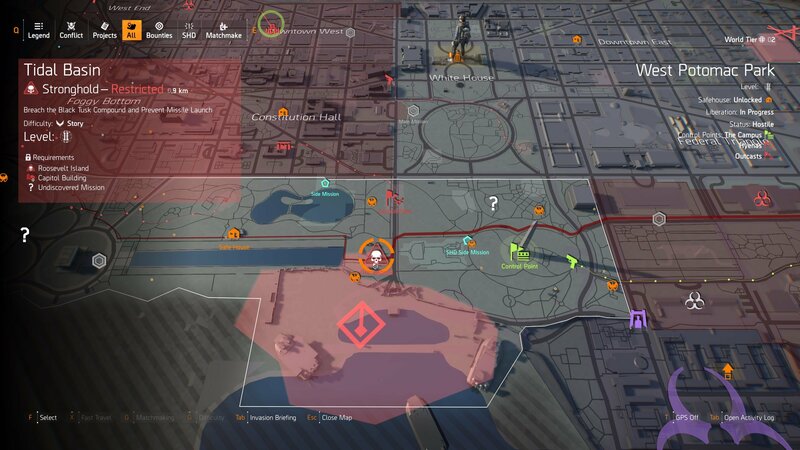 For more information be sure to head back over to our The Division 2 guide hub. I know you can select a mission, select the difficulty and it will give you an option to switch it to invaded. Can you not do this for strongholds as well? I was able to do so for a mission when I was in another person's party, but not sure if that was due to mine never having done it before or if it was a regular feature. Mods would make this game so wild. Be awesome to get the mini nuke gun from fallout and just start nuking your way through the city.